The issue was this: Craig bought the bread. Can you imagine the gall? When he’s in a relationship with one of the most important food writers of his generation, buying the bread? Without asking questions like “what kind of bread” or “should it be sliced or unsliced” just going out and buying bread? I mean, really. So there I was, on a Sunday morning, staring at a loaf of perfectly nice white bread from the Village Bakery with only one problem: he bought it sliced. 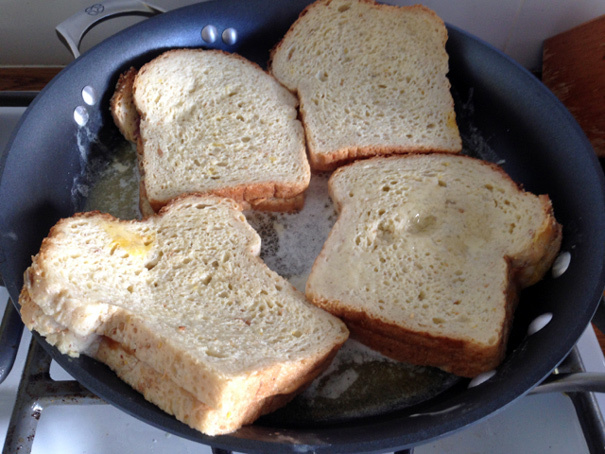 If I tried to make French Toast with those individual slices, it would be super wimpy French Toast. No one likes wimpy French Toast, not even wimps. 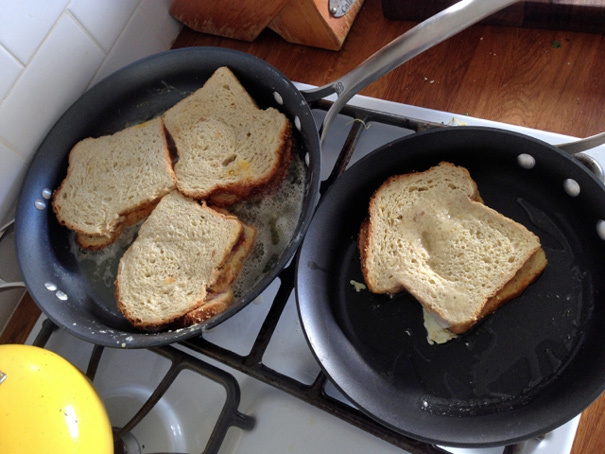 How to transform already-sliced bread into bread thick enough for everyone’s favorite butter-fried breakfast treat? A solution suddenly appeared: I could make peanut butter and jelly sandwiches and treat those like French Toast. 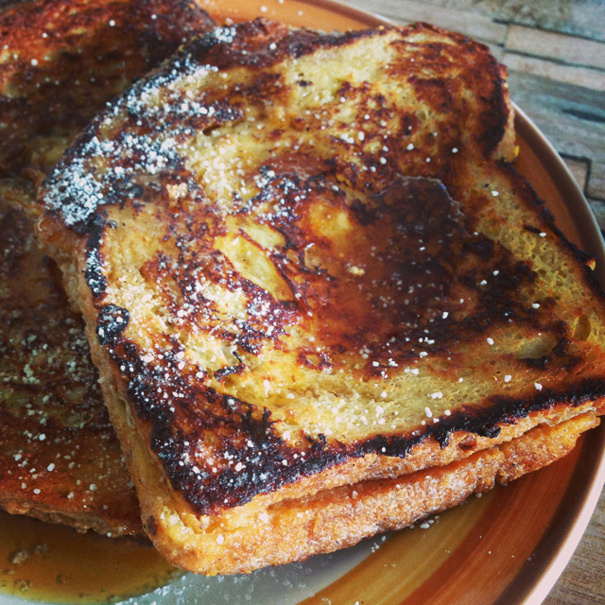 PB&J French Toast. Genius! 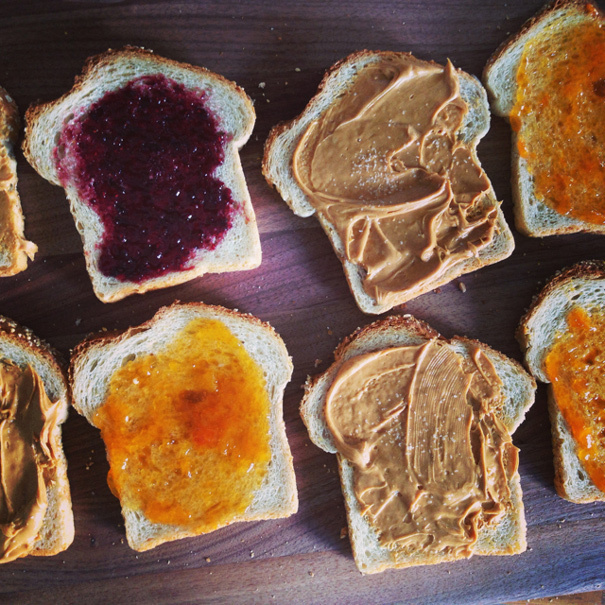 It was as simple as this: I made four peanut butter and jelly sandwiches. Three with apricot jam (because we had more of it) and one with berry jam (using up the last of it). I sprinkled a little salt on the peanut butter because I figured extra salt would help cut all the sweetness. Then I made a simple French Toast batter without any sugar: 3 eggs and a cup of whole milk whisked together. A pinch of salt, a splash of vanilla. Then I melted a whole stick of butter in a large skillet (ya, that’s a lot, but I figured, “What the Hell? This is a special treat.”) Once it was hot and foamy, I dipped the PB&J sandwiches in the egg batter until they were saturated on all sides and added them to the pan with the hot butter. I mean: who wouldn’t want to eat that for breakfast? Communists, that’s who. 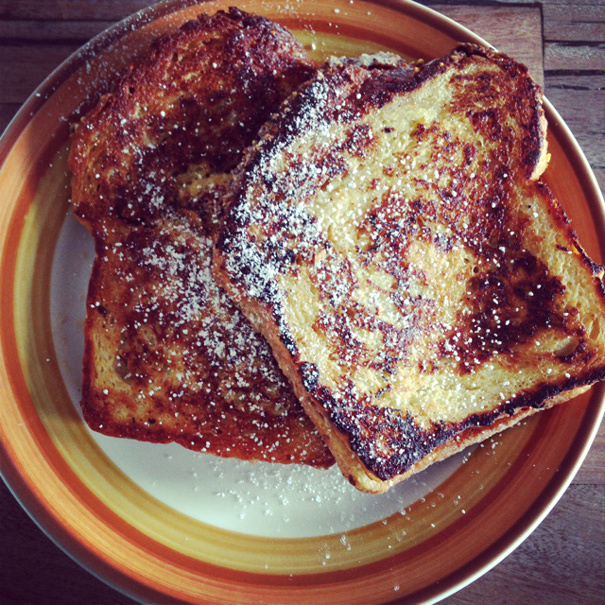 To serve, I lifted the French Toast on to plates and sprinkled everything with powdered sugar. Look how elegant. …it’s pretty irresistible. 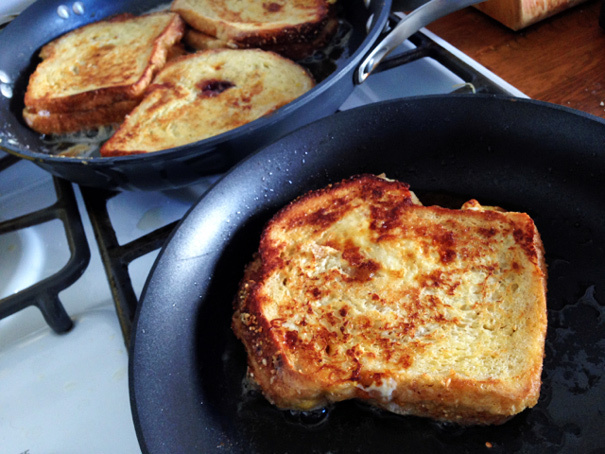 And a great solution for when your bread is too thin to make good, hearty French Toast. So Craig’s unforgivable error turned into a blessing. Still, in the future, when it comes to buying bread, we’ll let the professionals handle it. What lives in a pineapple under the sea? SHERBET!